I often refer to my Simple Content model as a three-legged stool: a blog, social networks and email. When appropriate, there’s a fourth leg on the stool, which is an event, such as a seminar, workshop, demonstration, etc. The blog generates original content which is then broadcast out over social networks and email. The content can drive attendance to an event, if that’s in your plan. All of these elements might be considered “owned” media, because you have complete control over each of them. However, it can be argued that you only have partial control over the social networks which are constantly tweaking their interfaces and formats, and they have the right to censure you if they so desire. The advantage of owned media is that it is the cheapest and easiest to build. On the flip side, it takes the longest to capitalize and it’s almost impossible to measure an accurate return on investment (ROI). I use the following two questions as my yardstick: Did you make more money in the twelve months after you built the media than you made in the prior twelve months? Was that extra money exponentially more than your annual costs to maintain the owned media? If you answer yes to both those questions, I’d call that a positive ROI. You use your owned media to foster and grow a longer term relationship with your audience, particularly people who already know you, such as customers and prospects. Leads are more often generated through the other two media types, earned and paid. In many cases, you want to use your owned media to remind your customers that you’re working for them and to remind your prospects that you’re working for your customers. Many prospects will use your owned media to sniff your bait before they bite. It can take some time to scale up owned media. A brand new blog is not going to have a very deep archive, after all. And you have to be wary that most people will not fully trust what you, the owner, has to say, because, of course, you have a vested interest. So it’s important to guard your language in owned media. If you must brag about your good or service, use supportable, verifiable facts and positions that are in agreement with what others are saying, which brings us to earned media. If owned media is what you’re saying about yourself, then earned media is what others are saying about you. This can refer to items from your owned media getting placed on other channels such as news sites, YouTube and other blogs. It can also refer to anything that you promote through public relations efforts. Earned media also encompasses broader word-of-mouth advertising. There may or may not be costs associated with earned media, but it’s not necessarily free. It may require an expensive PR rep to get a piece placed in an appropriate channel, but if that channel publishes it, it is no less earned. You have less control over earned media. A particular media outlet may decide to change, enhance or comment on your piece when publishing it, which can significantly change your message. However, it’s the most credible source of information your audience can have. They’ll trust what others say about you before they’ll trust what you say about yourself. Isn’t that why we try to get someone else to talk us up to that hottie we want to date? While earned media can be almost impossible to measure in real terms, it can have a significantly higher impact on sales than owned media. It has almost as long a shelf-life as your owned media, especially on the Internet where nothing ever seems to go away. Although it’s difficult, bad word-of-mouth can be overcome. Look no further than the miraculously resurrected career of Robert Downey, Jr. Paid Media is just that, the media you purchase for a fee, including display ads, pay-per-click (PPC), TV/radio spots and paid search. It’s generally much more expense than the other two but tends to have the highest impact on sales. In fact, a clear ROI can usually be calculated on well-executed paid media. Paid media is where you can be the least shy. Shout the benefits of your offer in paid media. You don’t have to couch your language at all. However, you do need to be truthful or else you could wind up running afoul of the law or exposing your company to costly liabilities. Paid media is the most effective place to use a clear call-to-action, such as “Buy now”, “Click here” or “Sign up”. Because it’s the best way you have of reaching people who’ve never heard of you before, it’s the most predictable and bankable way to generate leads. It will feed your owned media and help create earned media. 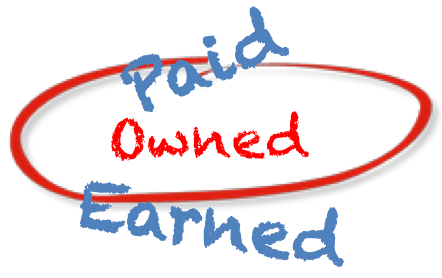 One of the most effective strategies is to use owned, earned and paid media to feed a traditional marketing pipeline. In my article, How Can a Simple Content Marketing Plan Work For You?, I describe the ever-narrowing funnel in which we feed suspects, convert them to leads and prospects and finally, customers. In a similar way, you can use paid media to convert suspects to leads, earned media to convert leads to prospects and owned media to convert prospects to customers. Of course, in the interconnected world wide web things don’t work so linearly, but employing this strategy will help you act with intention in terms of marketing, rather than throwing things at the wall to see what sticks.